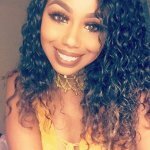 Deciding on where and how to further a college education has become increasingly more complicated. Options range from attending a traditional four-year college to pursuing a fully online education. Be that as it may, the reality is, nothing can really compare to the full experience of on-campus college life and when making that all-important decision on where to go to college, the benefits of a beautiful campus shouldn’t be underestimated. Working to an aesthetically appealing backdrop may provide that welcome touch of inspiration when hitting the books, and relaxing is arguably easier and more fun when you have lush green areas, elegant buildings and serene lakes to explore. 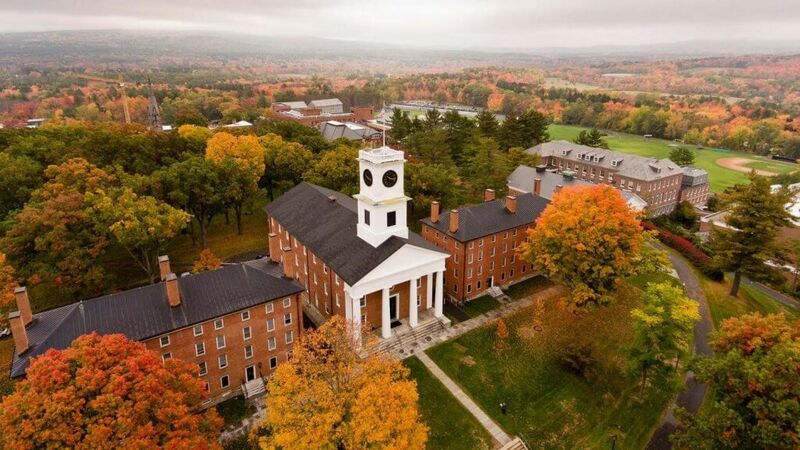 Massachusetts-based Amherst College was founded in 1821, and during the mid-1830s it could lay claim to being the second biggest institution of its kind in the country. Today, its 1,000-acre campus has expanded to encompass over 100 buildings, including exceptionally pretty examples such as the President’s House. Featuring Greek and Georgian Revival elements, this structure was designed by Warren Slade Howland and completed in its first form in 1835. Amherst’s natural highlights are remarkable as well: the campus boasts around 500 acres of untrammeled beauty in its wildlife sanctuary, which incorporates woodlands, fields, wetlands, ponds and the Fort River – all ideal for both research and relaxation. Boasting over 27,000 acres in Mount Berry, Georgia’s Berry College holds the honor of having the world’s most sizable contiguous college grounds. That huge expanse holds a wealth of woodlands, meadows, streams and even deer, whose population may number as much as 2,500. For those keen on outdoor pursuits, it’s ideal, offering students the opportunity to cycle, hike or horseback ride across over 80 miles of trails. English Gothic-style buildings give the campus an elegant European air, with some of the structures beautifully reflected in the waters of decorative pools. Equally as impressive are the Mountain Campus’ Mirror and Swan lakes, the latter of which sees the birds it’s named for glide gracefully across its calm waters. Possum Trot Church accommodated Berry College’s predecessor, a school for boys founded in 1902, and the building is still present on the college’s campus. The Hawaiian Islands are full of spectacular natural scenery, so it’s only fitting that the University of Hawaii system’s flagship campus, the University of Hawai’i at Mānoa, is such an attractive place to visit. Situated in a wealthy residential area of Honolulu, amid a lush valley and within sight of the Koʻolau Range, the 320-acre grounds are also often graced by rainbows thanks to the area’s showery climate. 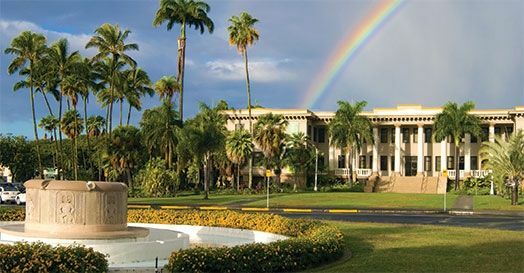 Among clusters of palm trees are some very good-looking buildings, too – such as Hawai’i Hall, which was completed in 1912. The earliest permanent structure on campus, the hall now acts as an academic service and administrative center. The institution itself was founded in 1907, relocating to its current site in 1912. Mount Holyoke College in South Hadley, Massachusetts boasts truly outstanding sights across its 2,000-acre campus. Yes, within its grounds the women’s liberal arts school features waterfalls, a pair of lakes, woodland trails perfect for riding and a botanic garden. The garden spans the campus and includes a beautiful arboretum and the Talcott Greenhouse, which plays home to an array of tropical and warm-weather plant life. The school itself traces its origins back to 1837 when it was established as Mount Holyoke Female Seminary – turning into Mount Holyoke Seminary and College in 1888 and finally shortening its name to Mount Holyoke College five years after that. Its originally 800-acre site was designed and developed over 26 years from 1896 by landscape architects Olmsted and Sons. 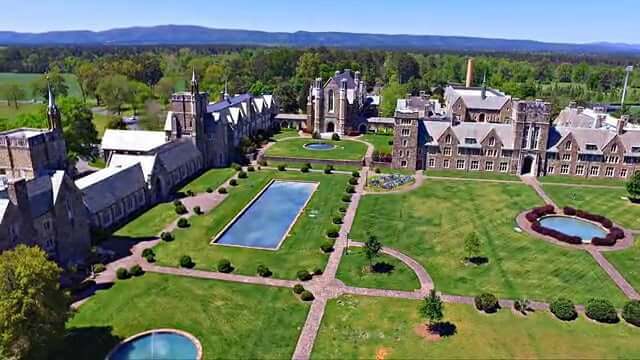 Magnificent Neo-Gothic buildings add a touch of opulent style to the 13,000-acre Sewanee: The University of the South campus, located on the Cumberland Plateau in Middle Tennessee’s southeastern corner. 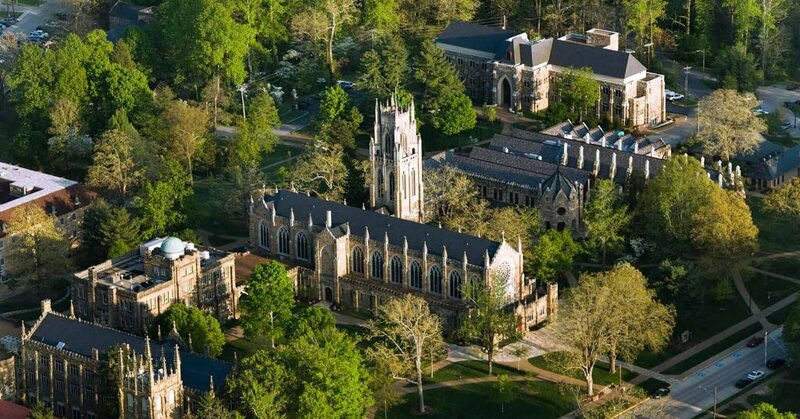 One of the most beautiful of all Sewanee’s edifices is surely All Saints’ Chapel, the work of distinguished American architect Ralph Adams Cram. The building boasts a tower, a rose window, and arched ceilings, drawing on design elements from iconic places of worship like the University of Oxford’s University Church and the Notre Dame de Paris. The chapel has had a long development history: construction started in 1905, almost a half-century after the founding of the school in 1857; however, owing to lack of funds it was not finished until 1959. Interestingly, the church’s eventual completion was thanks to the university’s then vice-chancellor Edward McCrady, who used Cram’s initial blueprint to help raise the structure that stands on the Sewanee campus today. The gold dome that tops the University of Notre Dame’s Main Building may be the most iconic feature of the school’s 1,250-acre campus, but there are plenty of other magnificent sights to be found on its tree-filled grounds in Notre Dame, Indiana. Among the highlights is the Neo-Gothic Basilica of the Sacred Heart, resplendent with a soaring, national record-breaking bell tower and sizable windows filled with stained glass. The edifice often features on lists of the most stunning university churches in the U.S. Notre Dame’s founder and first president Father Edward Sorin teamed up with Alexis Granger to develop the church’s blueprint, and it was dedicated in 1888. The University of Notre Dame was initially founded as a school for pre-university education in 1842, gaining its charter two years later. According to Boston architect Mark DeShong, “Princeton has beautiful buildings, but the exquisite landscaping amplifies them even more.” It’s certainly hard to disagree with him when walking across the Princeton, New Jersey-based school’s 500-acre campus, as stunning-looking Collegiate Gothic structures and immaculately tamed green expanses are in abundance. Perhaps the jewel in the crown of the Ivy League institution – at least when it comes to architecture – is the palatial Nassau Hall. The hall has stood in some form since 1756, ten years after the university’s foundation, and has remained a constant feature as the campus has grown around it. Nassau has been no stranger to misfortune, however, as it has burnt down not once but twice – in 1802 and 1855. The building’s present Italian Renaissance-style incarnation comes courtesy of Scottish-American architect John Notman, although it has undergone several renovations within the past century or so. no slouch in the good looks department. For nature-lovers, too, there’s plenty to explore – not least the university’s own botanic garden, which according to its official website “provide[s] a campus environment rich in horticultural diversity and beauty.” The garden also boasts a pond that’s home to ducks, dragonflies, and turtles. 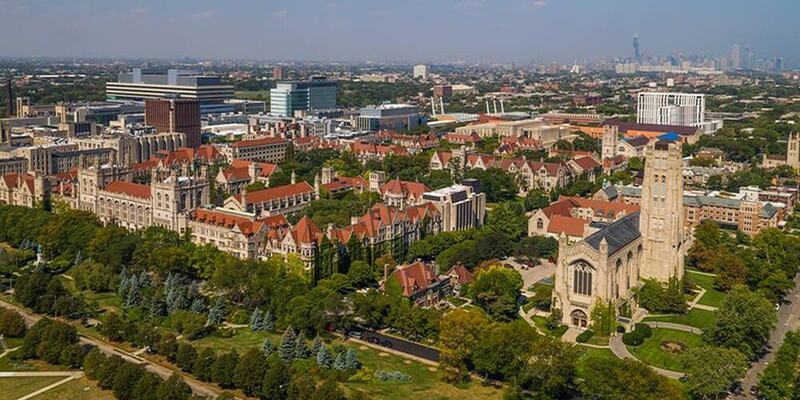 The University of Chicago itself was established in 1890, and its grounds were built around a donation of land from American businessman Marshall Field. According to Bryn Mawr College’s website, the school’s grounds contain some of the earliest instances of Collegiate Gothic architecture, which we’re informed: “served as templates for dozens of other campuses. ” Certainly, as far as beautiful spaces go, other institutions of higher learning couldn’t go far wrong if they followed Bryn Mawr’s example. The campus has a profusion of both lush foliage and awe-inspiring architecture. There’s even a picture-perfect duck pond nestled within the grounds, surrounded on all sides by abundant trees. The women’s liberal arts college was founded in 1885, and the idyllic 135-acre site in which it sits was partly the creation of renowned landscape architects Frederick Law Olmsted and Calvert Vaux. The University of Virginia could be said to have the presidential touch, as Founding Father Thomas Jefferson was responsible for its conception and – after the school’s establishment in 1819 – the development of its awe-inspiring campus. Jefferson’s original vision still makes an impact on the University of Virginia’s now 1,682-acre grounds in Charlottesville, Virginia, most notably through the stunning, Palladian-style Rotunda – which in its design draws inspiration from Rome’s celebrated Pantheon. Finished in 1826, the Rotunda holds the honor of being among just a trio of man-made modern U.S. structures to be designated UNESCO World Heritage Sites. In 1976 the campus as a whole was also named “the proudest achievement of American architecture in the past 200 years” by the American Institute of Architects.